An annual study into how UK journalists feel social media impacts on their work was announced this week by Canterbury Christ Church University and public relations and media services outlet Cision. The report’s findings are based on 769 responses from UK journalists. According to a release from the university the study found an “increasing number of concerns about productivity, privacy and the future of journalism”. For example, the number of journalists who said they felt social media improved their productivity fell from 49 per cent in 2011 to 39 per cent in 2012. At the same time, the percentage of those who disagreed that social media improved productivity increased from 20 per cent to 34 per cent. Journalists were also less positive this year about the impact of social media on their relationships with their audience. In general, they think that social media allows greater engagement with their audience, but the number who strongly agreed with that sentiment dropped from 43 per cent to 27 per cent. The study can be downloaded from Cision. For more on the findings see this report by the Drum. This entry was posted in Social media and blogging and tagged Journalism, social media, study on September 19, 2012 by Rachel Bartlett. 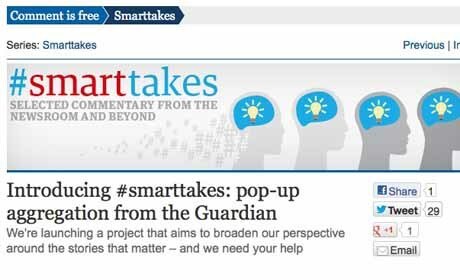 The Guardian’s US operation announced yesterday the launch of a new socially-driven aggregation series, #smarttakes. According to a post on Comment Is Free the new project will see the introduction of “a pop-up aggregation tool that collects standout pieces of commentary and analysis from Guardian readers”. We’ve been experimenting with the concept in recent weeks, like when the drone scandal broke, when Facebook went public and when the Montreal protests erupted. As of today, pop-up aggregation has a permanent home on the Guardian. Currently the project is US only. The project will see users involved by tweeting about comment pieces with the #smarttakes hashtag. 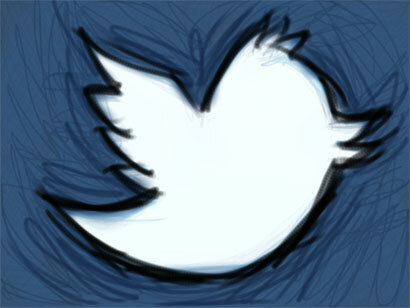 According to the Guardian announcement “great recommendations will also get retweeted from @GuardianUS”. Reporting on the new development Nieman adds that the Guardian will also offer a “curated roundup” on the series’ page. Over email, Michel told me one lesson from #MuckReads was how to create a long-term commitment to using a hashtag. That helps not just to populate the project, but to build support, she said. On the subject of open journalism at the Guardian, we recently spoke to national editor Dan Roberts about some of the lessons learned from the Guardian’s UK projects such as its open newslist experiment and Reality Check blog. 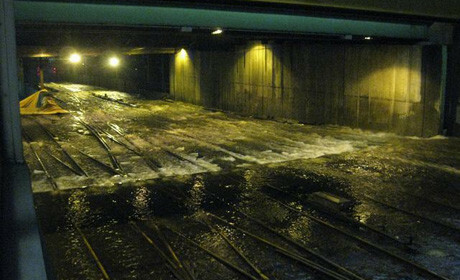 This entry was posted in Editors' pick, Social media and blogging and tagged #smarttakes, aggregation, guardian, social media on July 19, 2012 by Rachel Bartlett. After being fired from one job and finding her house surrounded by Zimbabwean paramilitaries six days after she set up Capital Radio and aired a test broadcast, Gerry Jackson then launched SW Radio Africa. And Facebook has become a key tool for finding stories, Jackson told today’s Guardian Activate London conference in a talk called “media in exile”. Jackson spoke of the human rights abuses, corruption and repression in the country, and how the radio station and SW Radio Africa website aim to expose wrongdoings. She told the conference that Zimbabwe is “trapped” as “nothing changes”. We are groundhogs [like in the Bill Murray film Groundhog Day]. We are reliving the same day over and over. That’s what it feels like in Zimbabwe. But although we are groundhogs and do the same stories over and over again, we do highlight stories that rest of the world doesn’t seem pick up on. Jackson is particularly proud of the radio station’s exposes. 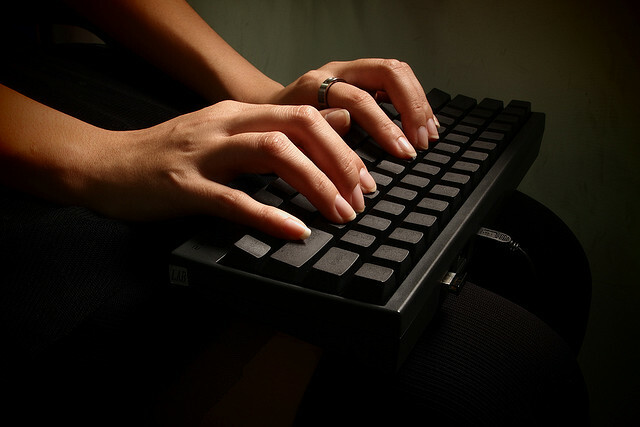 The website published a leaked list of the names of 450 individuals who had allegedly committed acts of violence. The expose received a “huge response on Facebook”, Jackson said. But explained that “people were very frightened to write publicly” so instead messaged the journalist who worked on the story to report details of further atrocities. 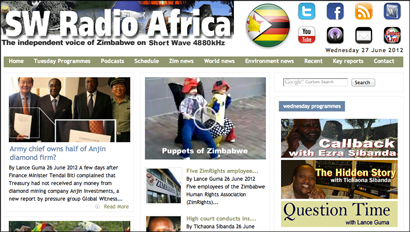 The reporters at SW Radio Africa also arrange most of their interviews via the platform. They are also aware that the ruling party “keeps a close eye on Facebook”. Jackson said around one million people in the country of roughly 12 million are on Facebook, with two million internet connections and nine million mobile phones with 700,000 of those being used for internet access. It’s impossible to underestimate how much Zimbabweans love Facebook. She said that not only includes those within the country but Zimbabweans living in exile, which is perhaps one third of the total population. And key political figures are on Facebook, including members of the Zanu-PF party. It’s interesting to see their list of [Facebook] friends. This entry was posted in Events, Press freedom and ethics, Social media and blogging and tagged #Activateldn, SW Radio Africa, Zimbabwe on June 27, 2012 by Sarah Marshall. Digital storytelling platform Storify has announced that a Storify produced by US journalist and student Ben Doernberg, which curated the latest responses and reaction to a video in which a bus monitor is seen being taunted (there’s more on this story from the BBC at this link), has hit a new record for Storify by recording more than 1.5 million views. At the time of writing the number of views stood at 1,575,345. More than $650,000 has also been raised after an Indiegogo page was set up to give the bus monitor a holiday. See the Storify about the record here. This entry was posted in Online Journalism, Social media and blogging and tagged bus monitor, Digital storytelling, storify, us on June 27, 2012 by Rachel Bartlett. Social magazines and newsreading apps are a “key part of the puzzle”, if not a game-changer on their own, when it comes to digital strategy for publishers, and news outlets should be prepared to give up control over how content is shared on other platforms. In a session on social magazines and newsreading apps at the News World Summit in Paris editor-in-chief of Digital First Media Jim Brady said the technology is responding to the changing ways people are accessing content. Consumers coming into the market made it pretty clear about what they want – they want choice, they don’t want to necessarily consume a package containing content from one brand. Tthey don’t necessarily want to get it on the platform you’re delivering it to. They want to consume information by subject in a lot of cases and not by brand. And in order to meet these needs news outlets need to “step away” from the mentality of “trying to maintain control”. The more control you try to exert the less successful you’re going to be. He added that publishers of high-quality content should “do all the things you have to do to let people in the world know” about what you’re producing. Let your content serve as a travelling salesman. Publishers’ “resistance of giving up control is something we have to give up”. He also warned that websites are becoming “less and less important”. Newsreading apps are highlighting that “more of your audience are consuming content, not print and not the web, a third whole category of content”, he said. So Brady encouraged publishers to let go of control and get content on these platforms. You can’t cant change the game until you change the thinking. That’s where we’re still short. Robert Picard, research director at the Reuters Institute added that publishers do not have the choice of whether such platforms increase in importance. The choice available “is whether we make use of them to best possible use”, he said. 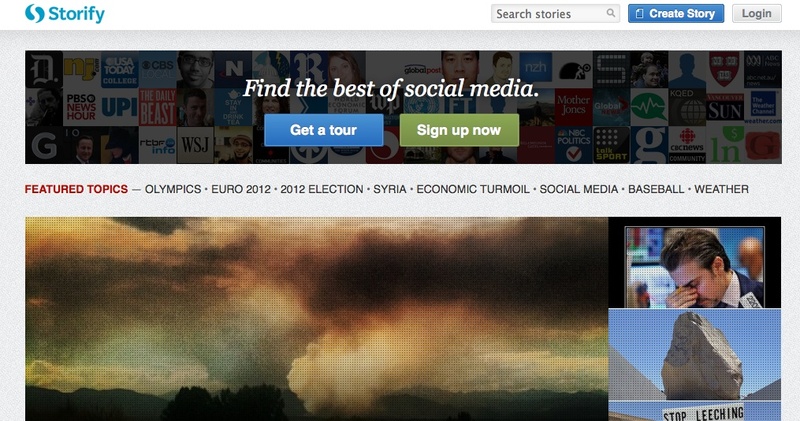 Or news outlets can have their own social readers, he added. 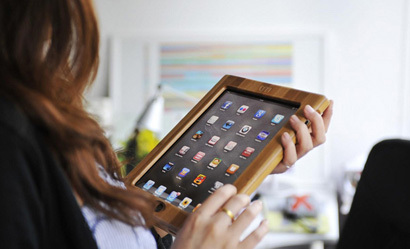 But then the challenge is how to get users to engage with their content, rather than others. This entry was posted in Online Journalism, Social media and blogging and tagged #gen2012, apps, newsreader apps, social on June 1, 2012 by Rachel Bartlett.